Cooks can keep fresh herbs close with this high-design, low-maintenance, self-watering planter. The rich, piney smell of rosemary. The spicy-sweet scent of oregano. Thyme's earthy fragrance, with its notes of clove, camphor, and mint. 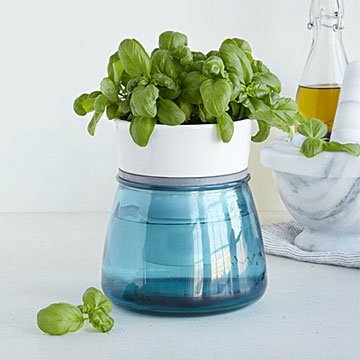 Cooks can keep herbs' fresh aromas and flavors elegantly at hand with this high-design, low-maintenance, self-watering ceramic and glass planter. Simply pick up some little herb plants, add potting soil to the ceramic pot (if needed), and plant. Keep the beautiful blue glass reservoir filled with water. That's it. Flavorless dried herbs, wilty "fresh" grocery store ones, and window herb gardens you forget to water—all that's in your past now. Take a deep breath. What you smell is your culinary future. Glass and ceramic made in Spain and Germany. Assembled in Germany.